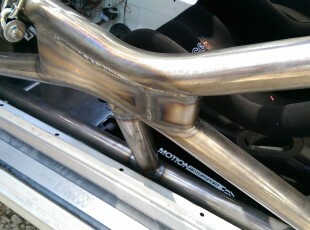 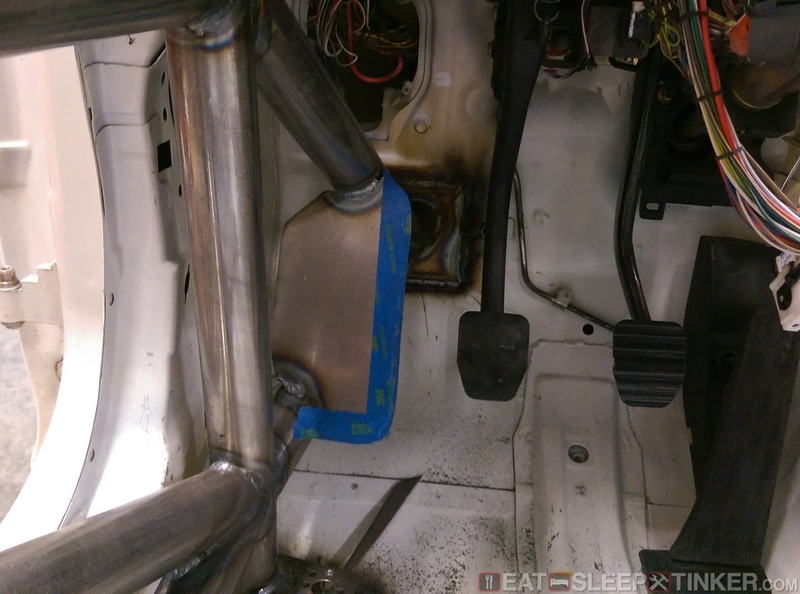 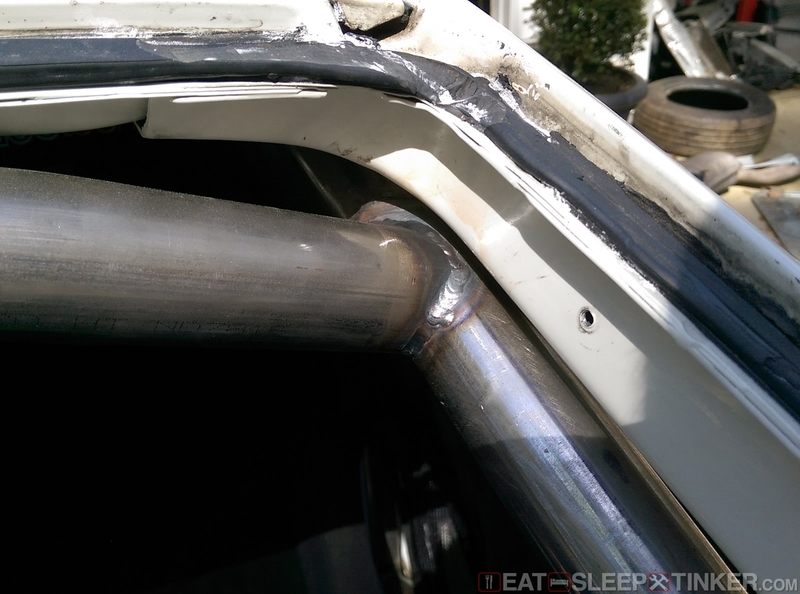 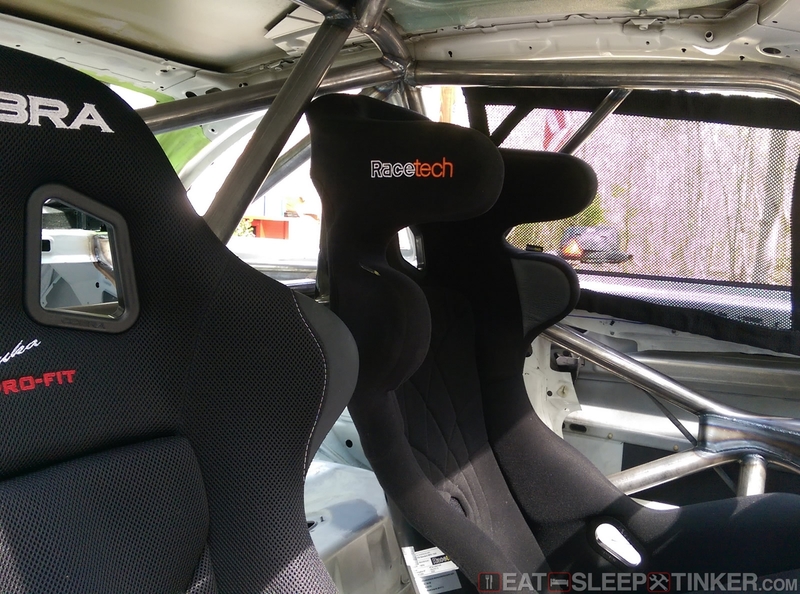 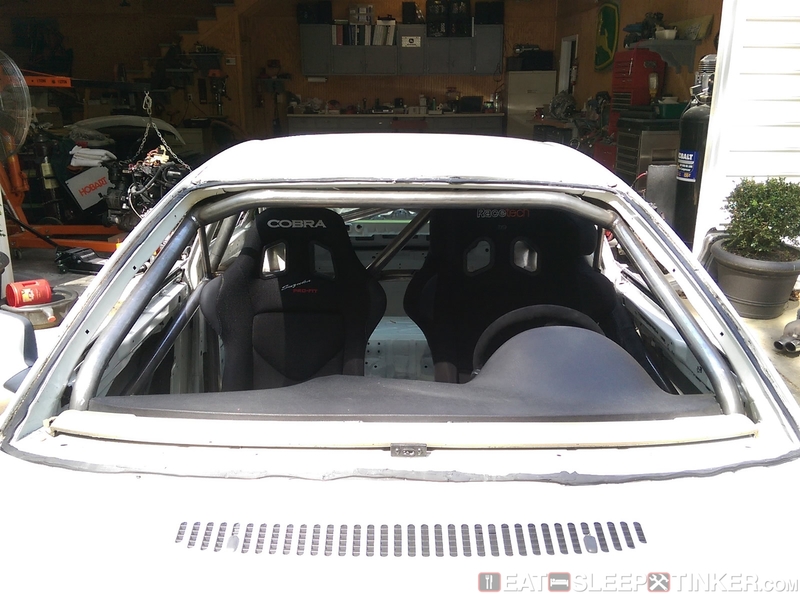 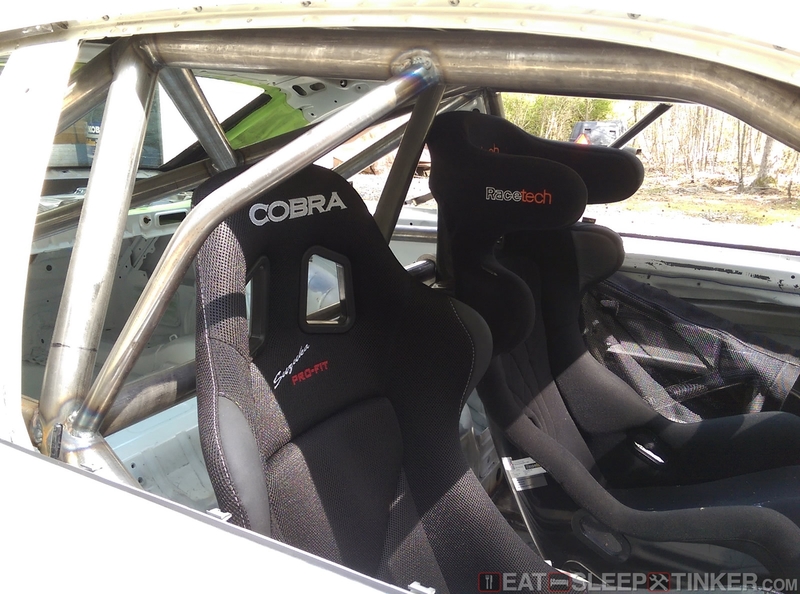 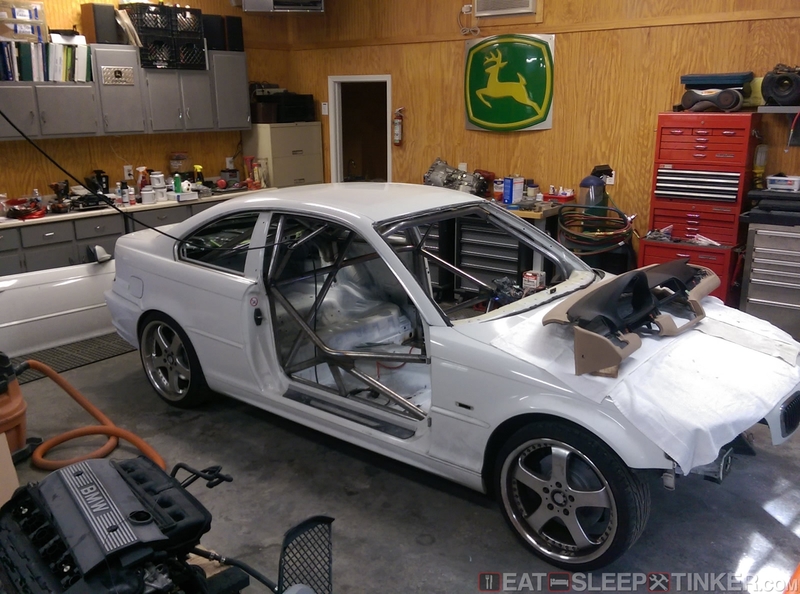 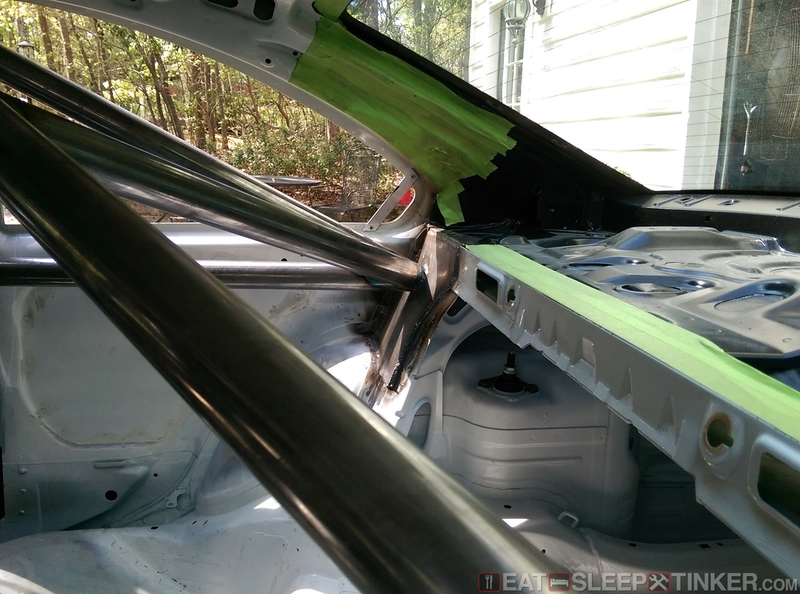 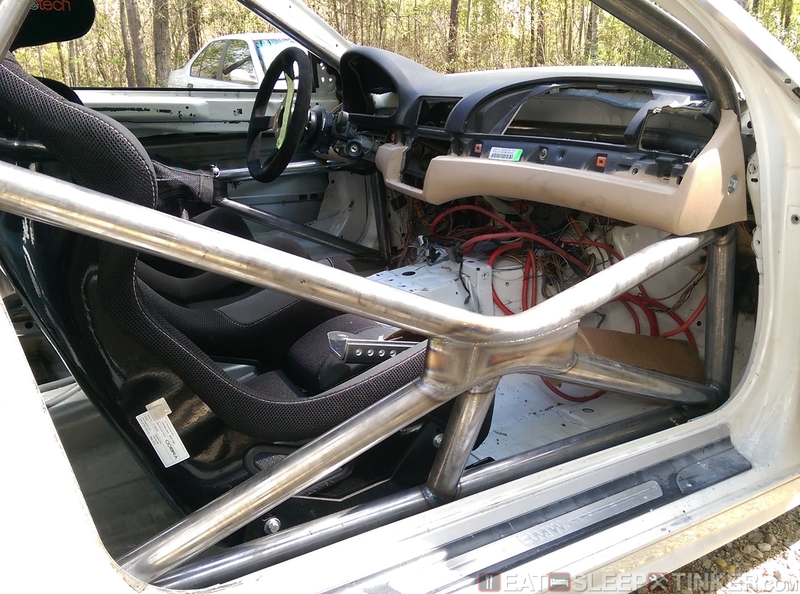 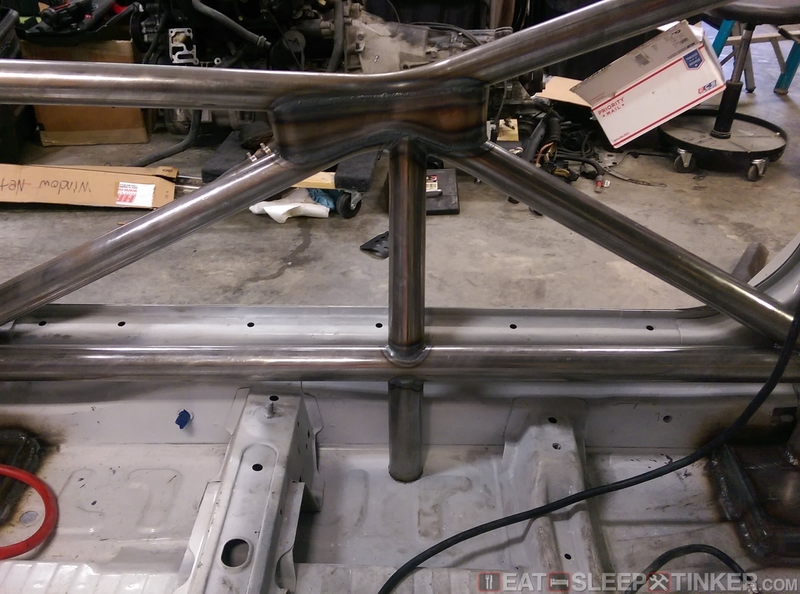 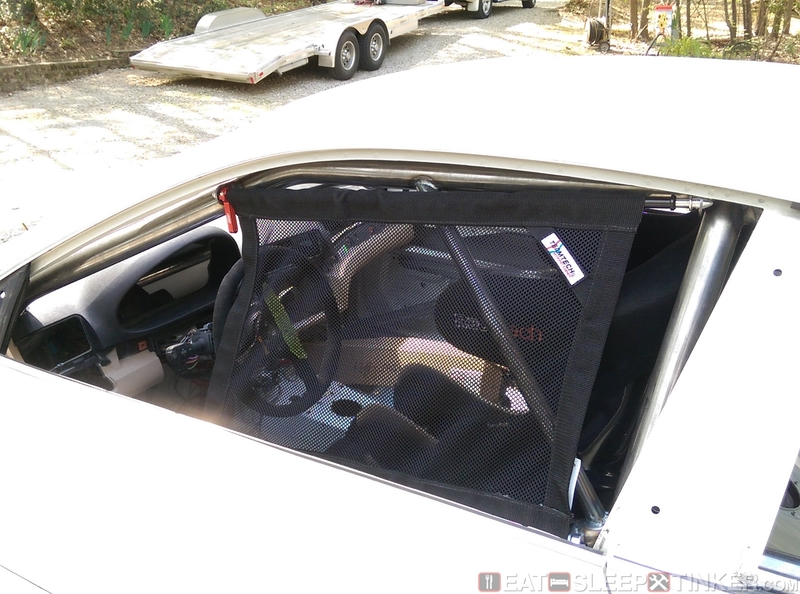 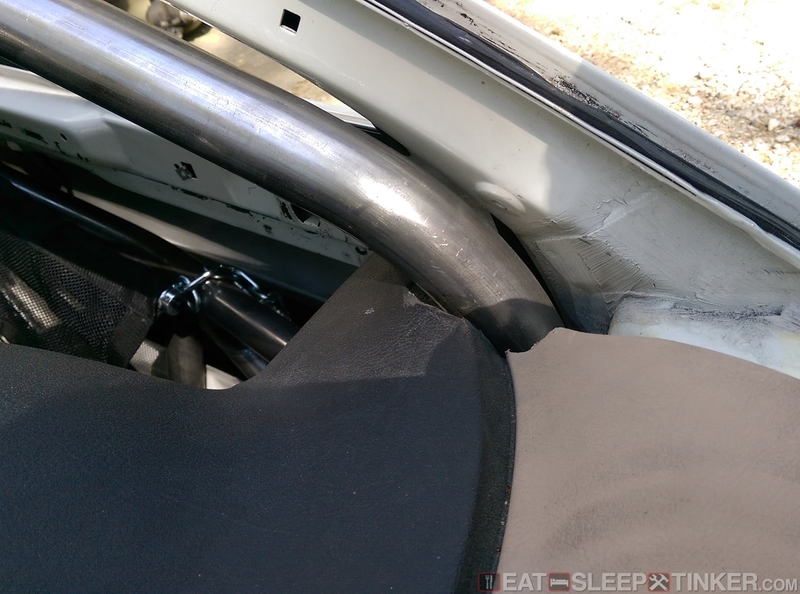 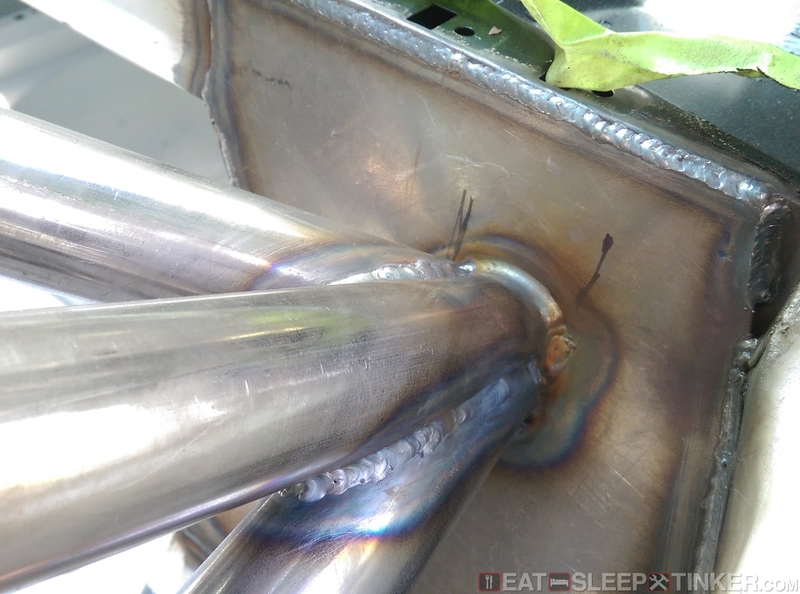 Eat, Sleep, Tinker.Spec E46 Build Part VII: Roll Cage - Eat, Sleep, Tinker. 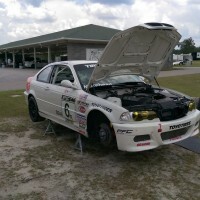 The Spec E46 cage must adhere to the minimum safety rules outlined in the NASA CCRs (or BMW Club Racing or SCCA rules if you run those). 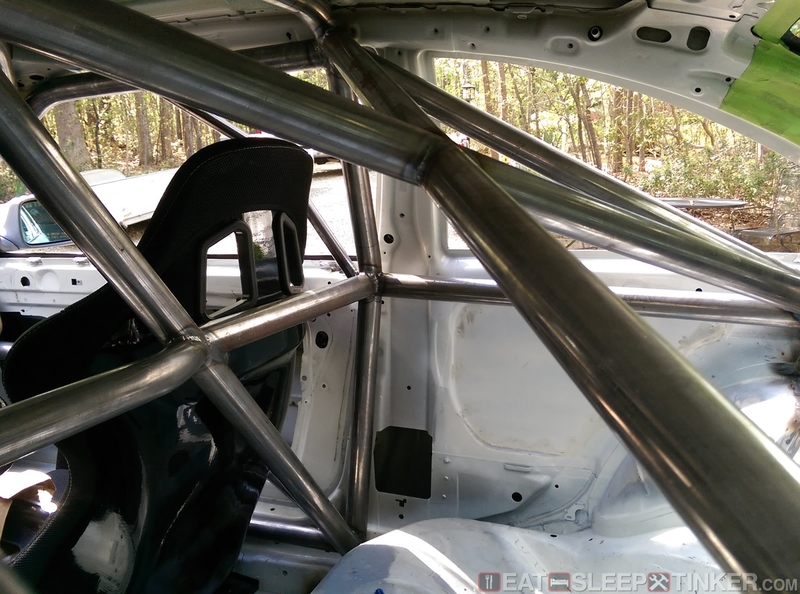 Essentially a generic 6-point (+2) cage will be legal. 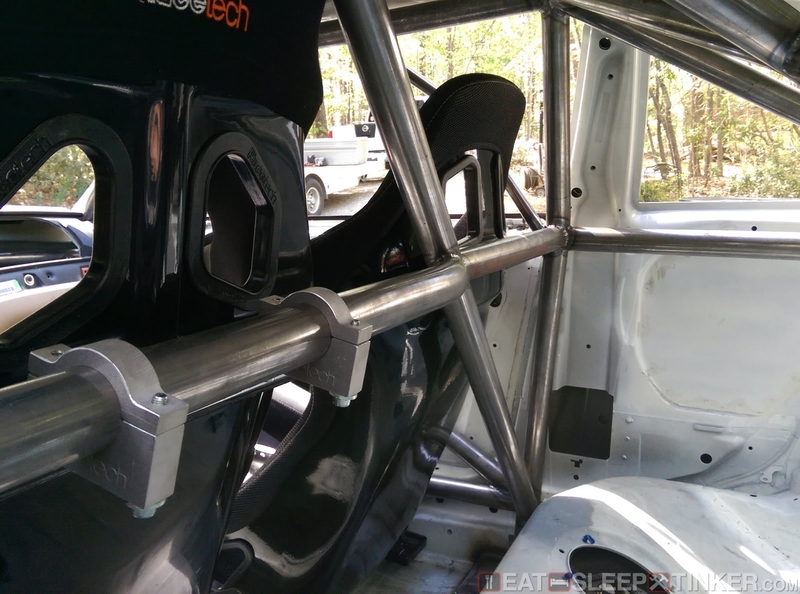 Refer to the CCRs for specifics on wall thickness vs. OD, which depends on running weight. The cage can’t pass though the firewall or be attached to any points other than where the tube terminates on the floor. 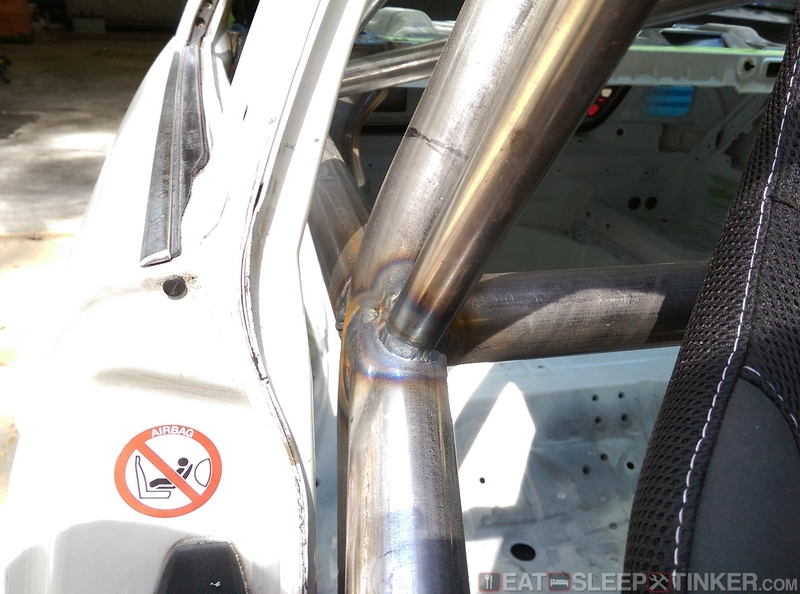 So tying the strut towers into the cage or welding the A or B pillars to the cage is not allowed. 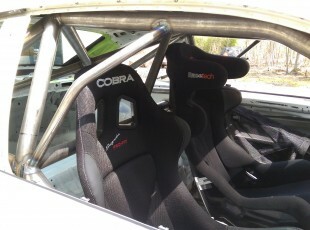 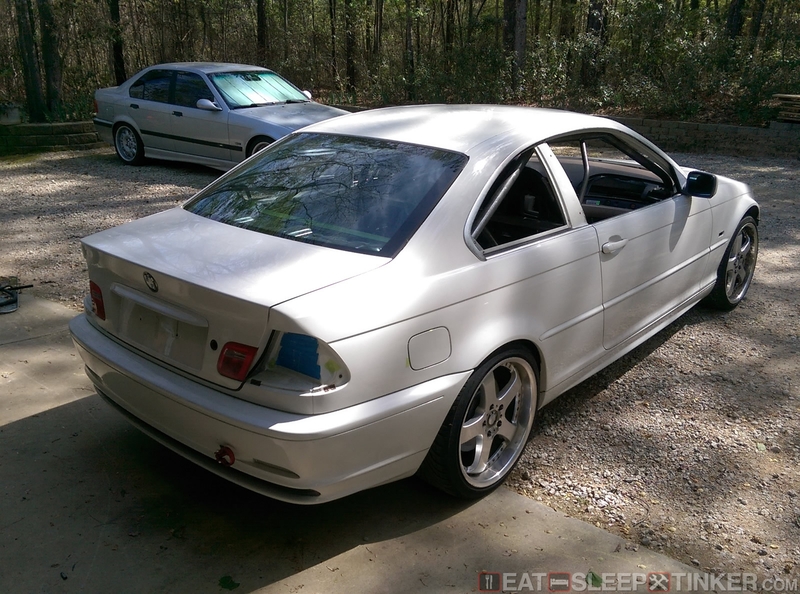 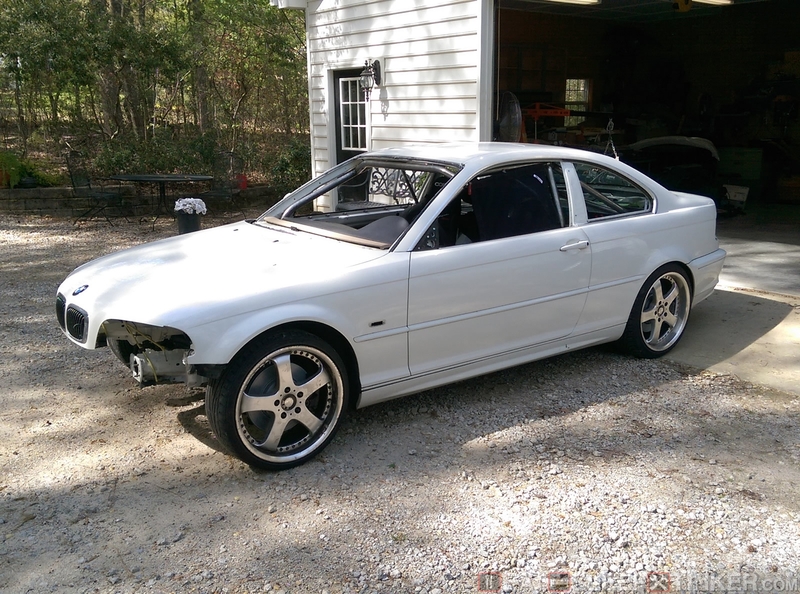 Another Spec E46 driver pointed me to SPF Racing in Lugoff, SC, who had just done the cage on his 330Ci. 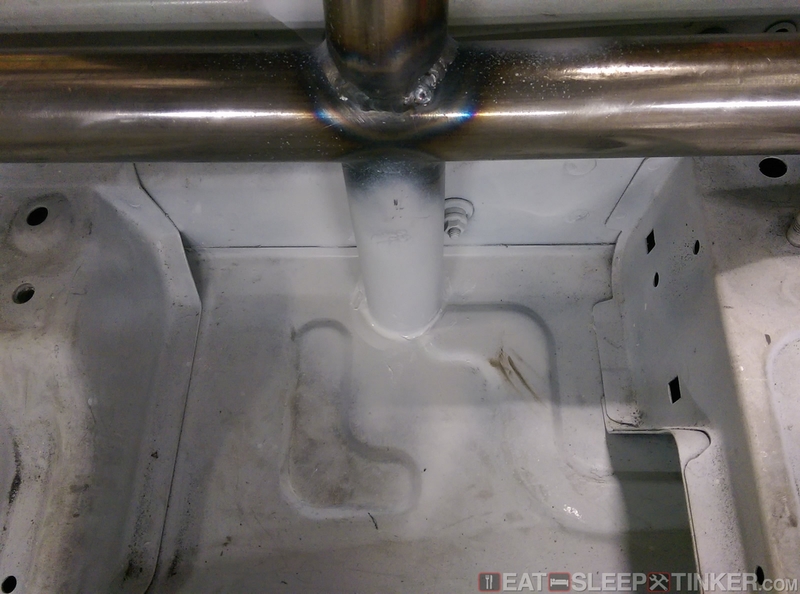 I was impressed with the photos of the work done and decided to give him a call. 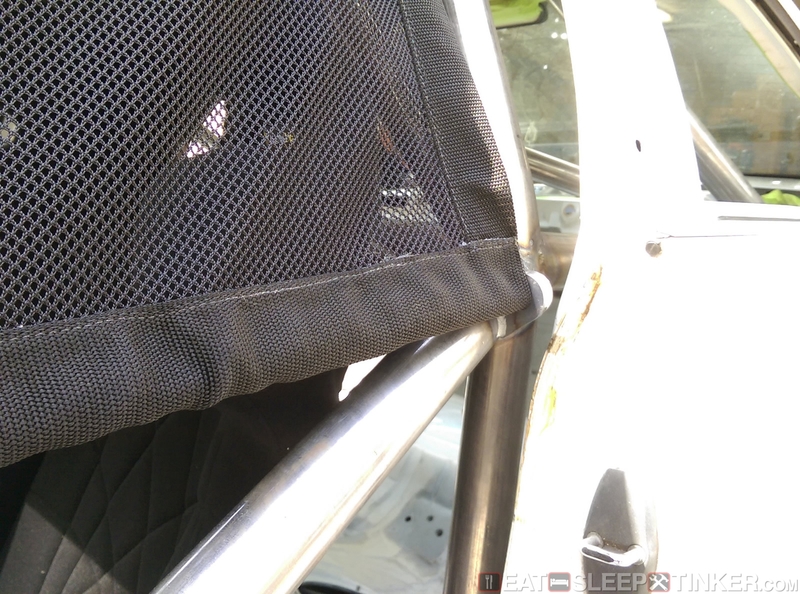 He (I say he, because SPF is a one man at home operation) was booked up for a month, so I took care of almost all the other items before getting the car caged. I also had center jack points added, which are tied into the door bars. 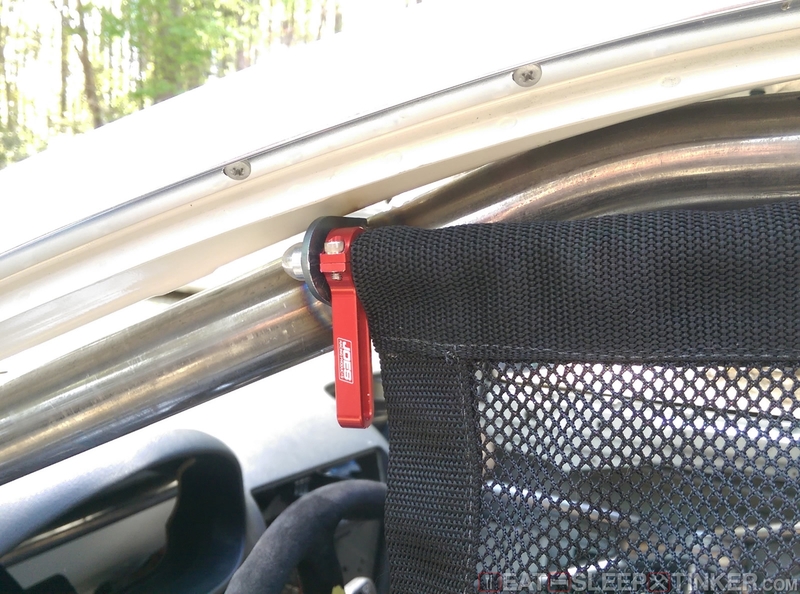 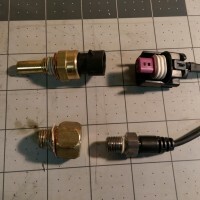 These are a huge help in quickly getting one whole side of the car up in the air and on jack stands. 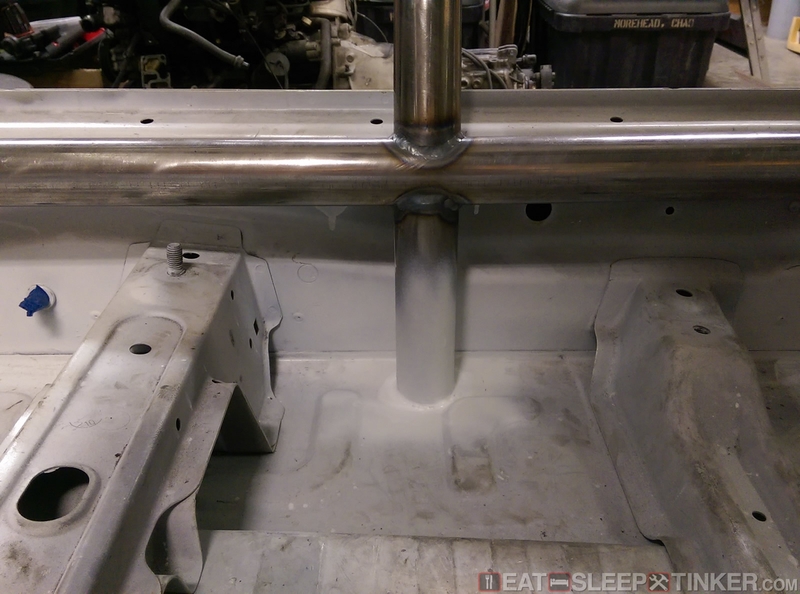 Since the rules don’t allow for anymore attachment points, the tube just goes straight through the floor but is not welded to the surrounding sheet metal. 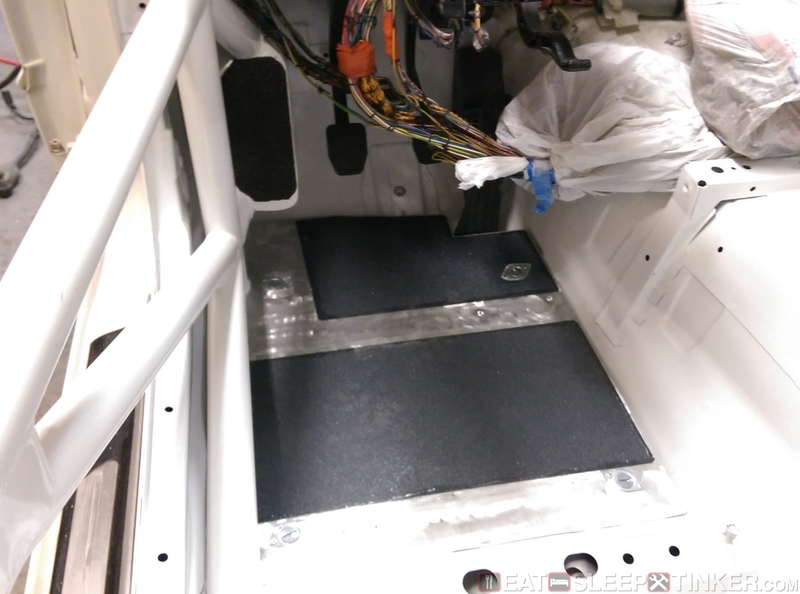 Another request was a floor pan for the driver’s side. Since the thick OEM insulation and carpet were removed, the floor was now well below the pivot point of the gas pedal. 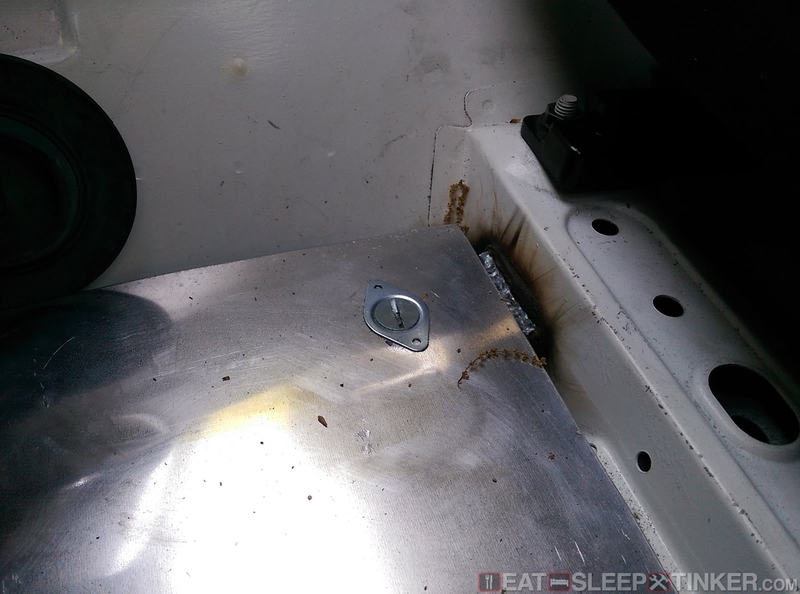 A simple aluminum floor pan raises it up to the normal height and makes it both easier to operate the pedals and get in and out of the car. 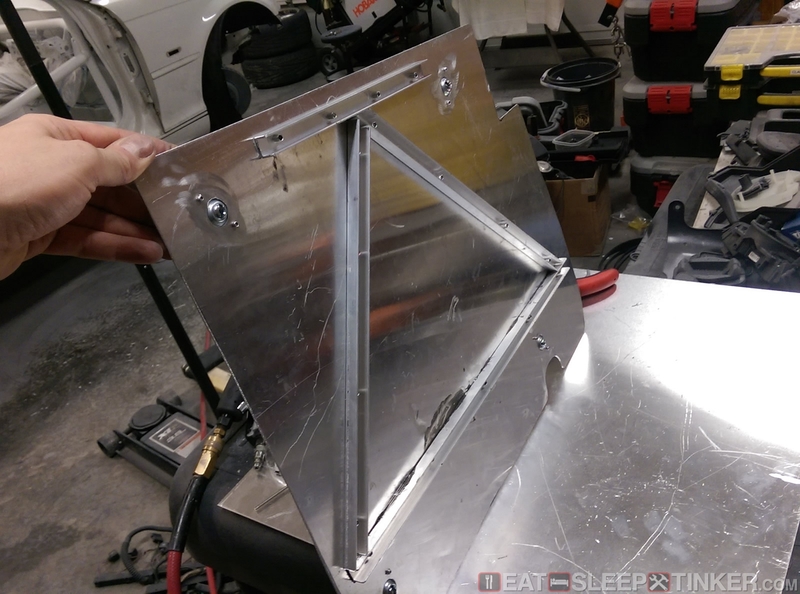 I ended up reworking the floor out of a single piece of aluminum, strengthened with some U-channel aluminum on the bottom. 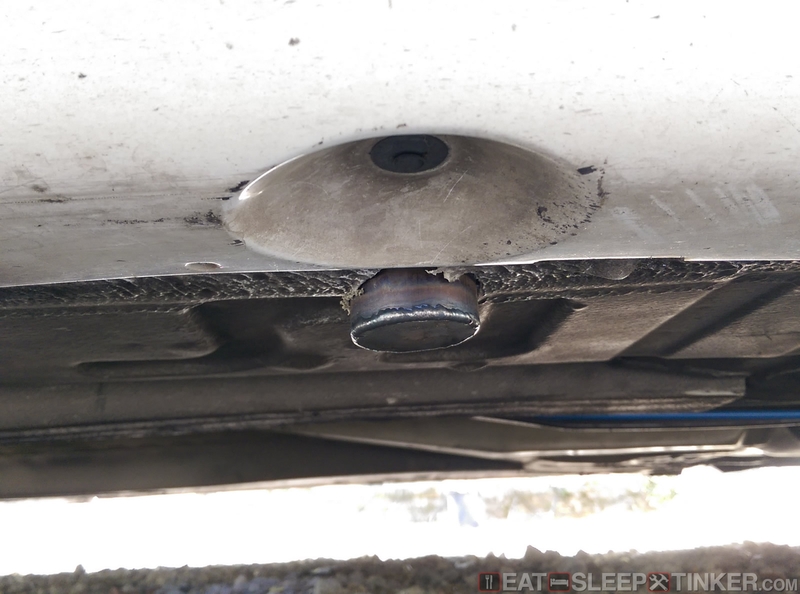 I added grip tape from a skateboard on the topside to prevent any slipping. The pan is held in place with large Dzus style fasteners. 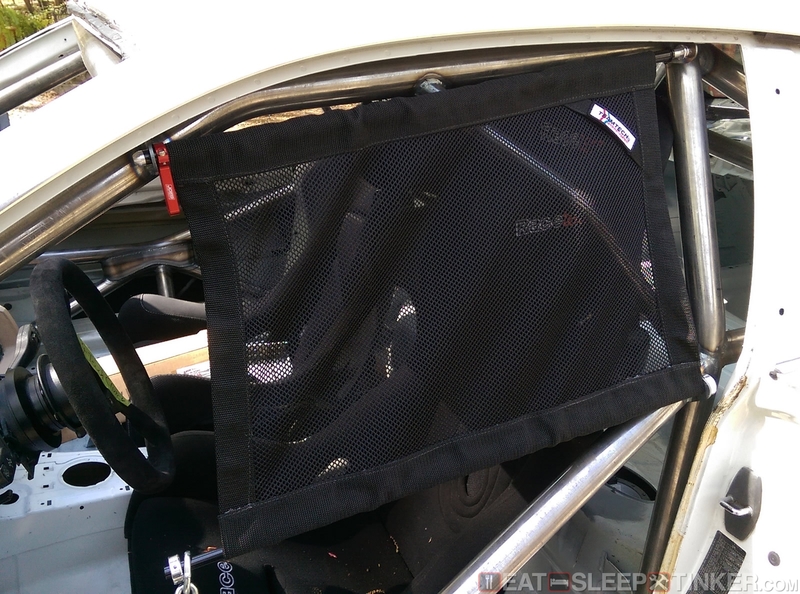 Window net mounts were also welded in place. 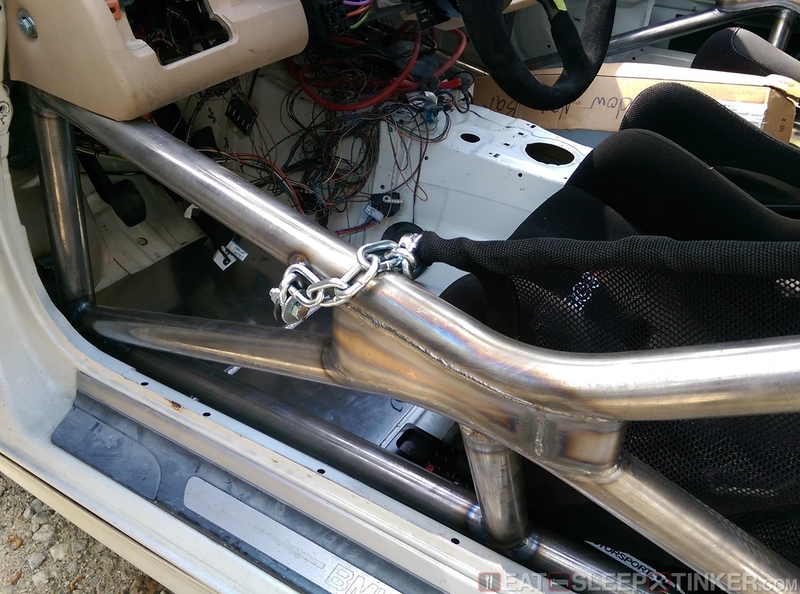 I used a Joe’s Racing rod to mount the upper side and the lower portion it held in place with steel chain link and a bracket. The window net is a mesh style from Teamtech. 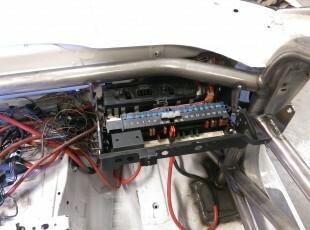 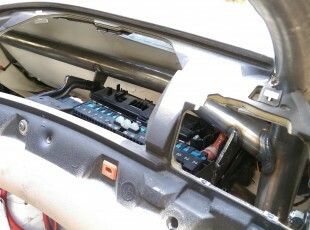 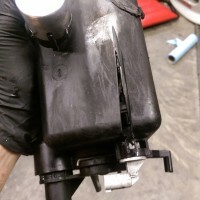 The stock dash bar was removed, but SPF was able to reattach the fuse box to the dash bar so that it operates normally. You can still close it in the up position, hidden behind the dash. 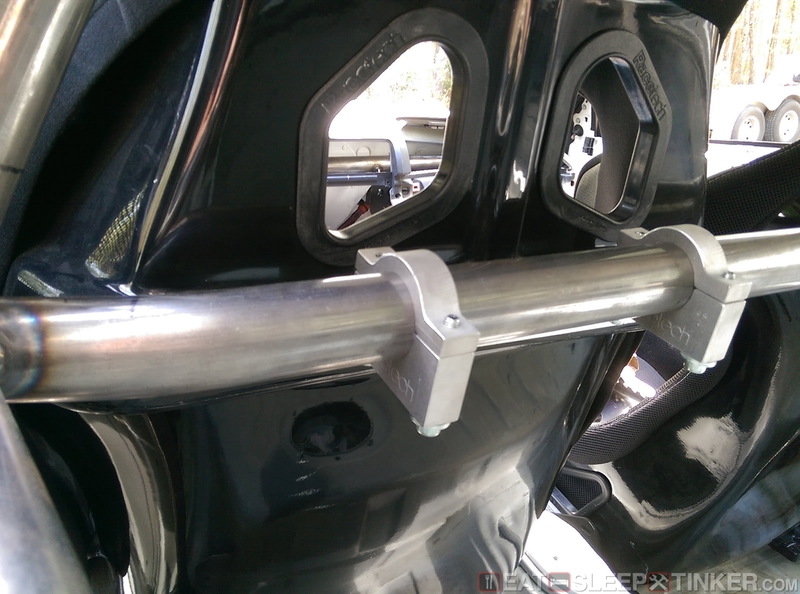 The dash itself is secured with a bolt on the left and right side by the A-pillar. I added an additional aluminum support off the transmission tunnel to keep the dash from moving while driving. 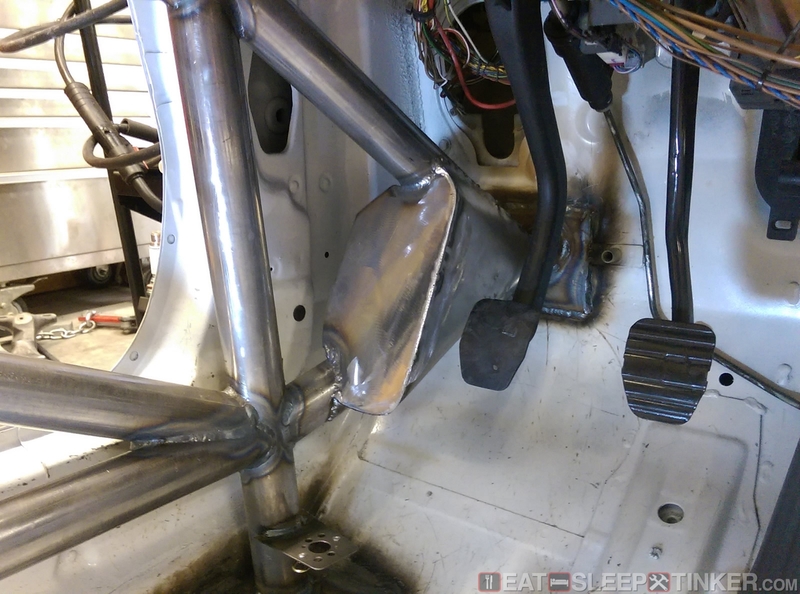 Another feature to the cage was a dead pedal welded to the foot protection bars. 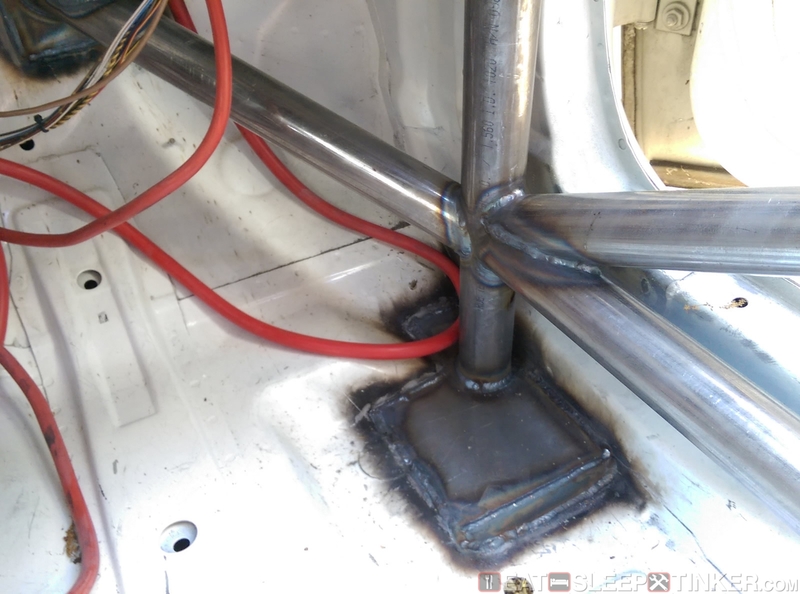 It was a little hazardous to my ankles so I smoothed out the corners and then welded on a piece of sheet metal behind the foot rest to keep my left foot from becoming trapped underneath. 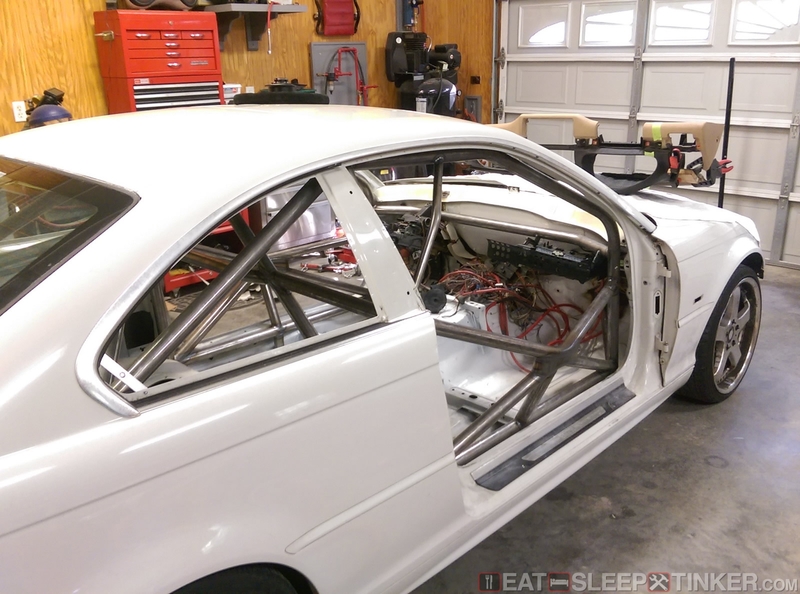 The following are just additional photos of the cage work. 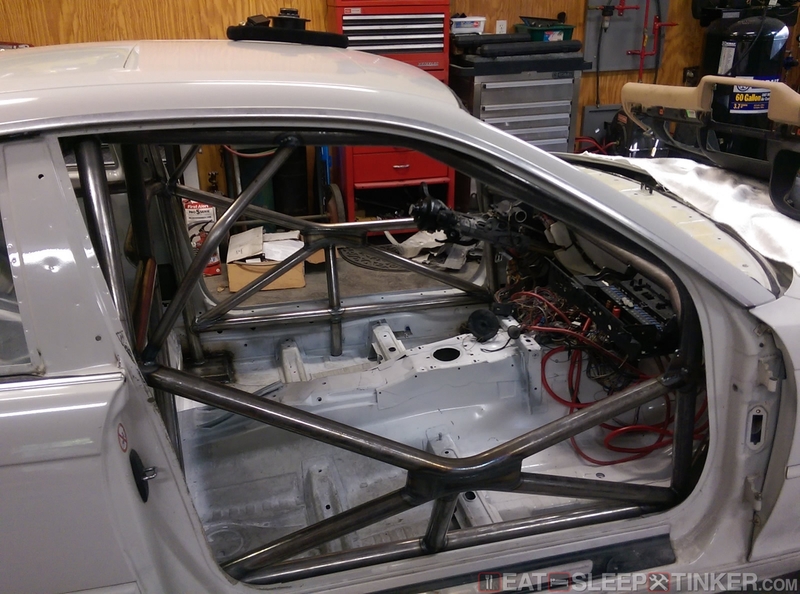 I find it helpful to review what others have done on their cages when starting a new build. 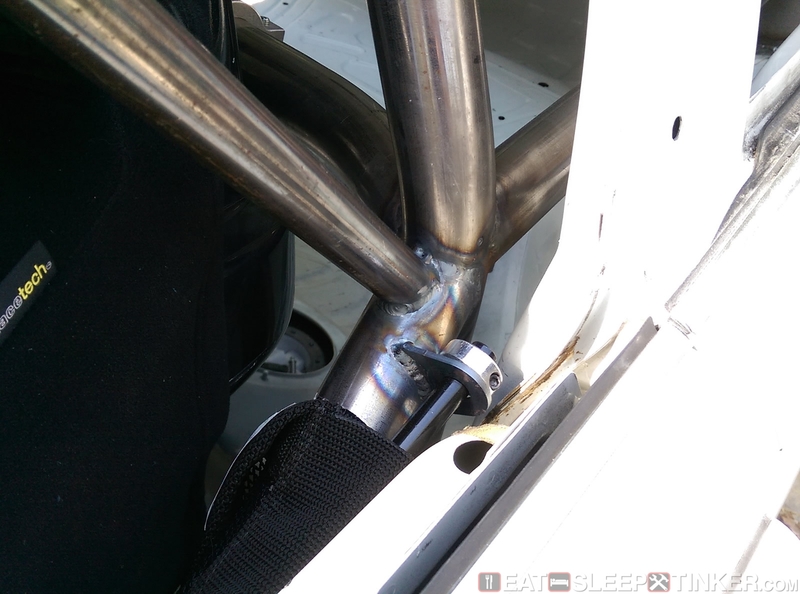 what was the reason the rollcage wasn't tied to rear strut towers and to rear subframe mounting points? 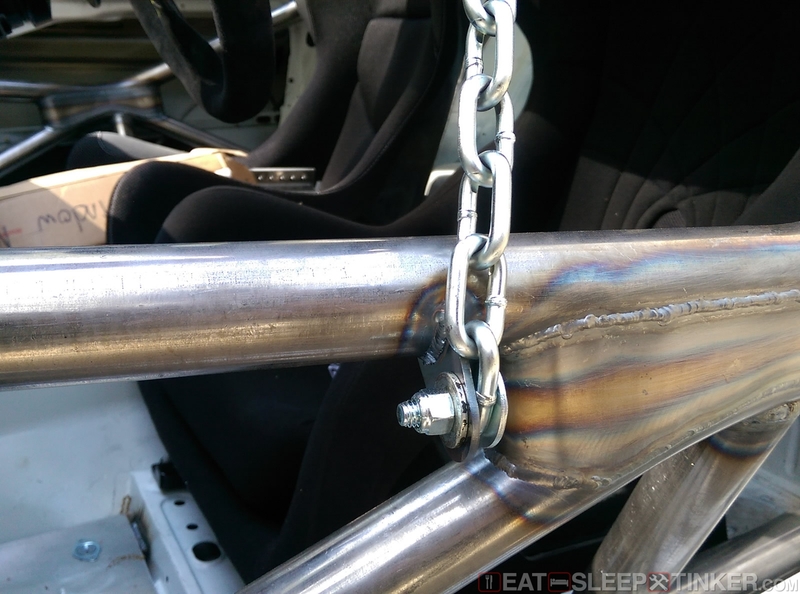 is it forbidden by Spec rules?